Temperature monitoring, immediate alarm notification and secure data logging are essential tools for staff responsible for stock stored in refrigerators and freezers. Costly inventory such as food products and pharmaceuticals can be seriously compromised by storing at incorrect temperatures and lead to stock spoilage. Edac supplies simple solutions to wirelessly monitor your fridge/freezers and is ideal for use in areas where running wires is difficult. For added security Edac can supply wireless temperature sensors that are used in conjunction with a vial filled with glass beads that act as a buffer against temporary temperature fluctuations caused by such things as doors being opened or defrost cycles. This allows you to read accurate temperatures of the contents inside the fridge rather than the surrounding air. 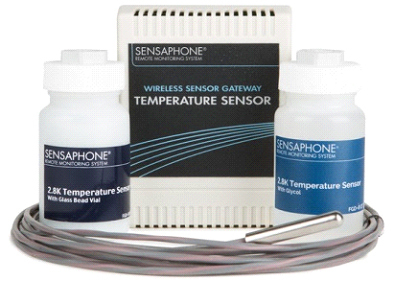 Sensors monitor temperature ranges from -50 to 80 degrees. We all know the importance and usefulness of sensors and remote monitoring systems that can help us with proactive maintenance and prevent HVAC equipment malfunctions or failures. For many years EDAC remote monitoring systems have been helping customers by providing sensors to monitor vital environmental and operating conditions in HVAC systems. Conditions that require continuous monitoring like, temperature, humidity, power failure, water leaks, and equipment failure are very important in environmental monitoring. With the use of an EDAC monitoring system, you can provide users the ability to monitor conditions and receive alarms via the built-in auto dialler remotely. EDAC also supplies sensors that are used to measure airflow in ductwork, the pressure differential in ducts and rooms, and dew point. The sensors can be used with any EDAC HVAC remote monitoring device that accepts a 4-20mA of an input signal. 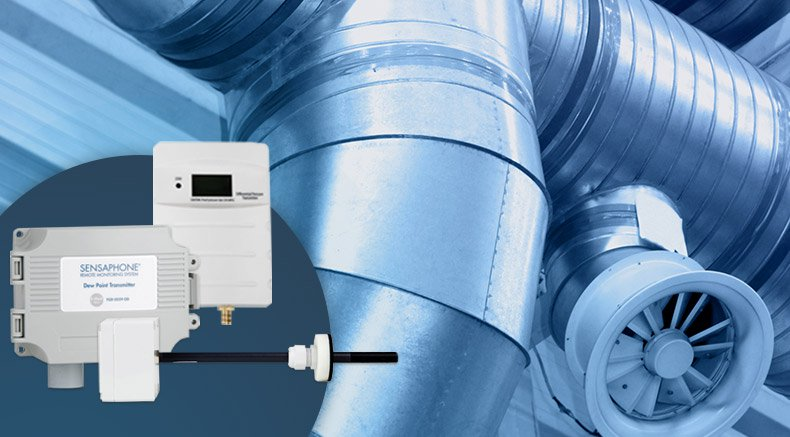 Duct Mount Air Flow Transmitter: To measure the rate of airflow and user alerts, this sensor is used with the EDAC system when conditions cross the threshold pre-set value. The sensor in the transmitter checks the availability of cool moving air and measures relative airflow from a 0-16 meters per second. Differential Pressure Sensor: The sensor is able to measure the air pressure in two areas and displays, if found, a difference in the readings. The sensor is widely used where a specific pressure differential maintenance is required. This sensor is used to check for the presence of a vacuum upon opening a door that could pull dust or other pollutants into the space. Differential Pressure is also used in air handlers. The sensor comes with a kit that allows measurements to be taken in ductwork or an attractive wall mount kit to measure ambient room pressure. Dew Point Sensor: To protect the system environment from atmospheric changes, we need a number of sensors to measure atmospheric conditions. Similarly, Dewpoint sensors are used to measure the temperature and humidity in the air that may condense and turn into dew. Dew point is critical in dehumidification systems that remove the moisture in environments like manufacturing plants. In refineries, this plays a crucial role as it requires dry air as moisture breeds fouling of sensors and actuators and promote rusting. The sensor comes enclosed in a Dew point weatherproof enclosure that is suitable for use in outdoor environments. An EDAC system not only monitors, it is also responsible for sending alerts when any conditions change from the normal range. With instant alarm alerts, you can take instant action before potential damage occurs. And with our monitoring systems, you can also see real-time status remotely from internet-connected devices. Once connected, you can also collect data from all the sensors. This data logging feature is useful for keeping tabs on your systems and keeping records of compliance. Sensor readings are securely archived and readily available from anywhere via cloud-based storage. It is fast and easy to print, graph or export accurate historical records, creating an audit trail of all user data activities, edits or deletions. Get the consultation from our remote monitoring specialists today to discuss your specific needs. Antennas are effectively transducers converting the electrical energy into electromagnetic waveforms between sending and receiving devices. While there are variations such as folded antennas, the basis of antenna design is a core conductor (referred to as a radiator) of ½ electrical wavelength in size. AC voltage and current is then applied to the conductor to create a resonant circuit to a given frequency (ie capacitive and inductive reactance equaling zero). At frequency resonance, only pure resistance is left, a function of Ohmic and radiation resistance. As Ohmic resistance creates heat energy losses, efficient antenna design optimizes radiation resistance in generating the waveform. The resultant waveform is a composite of a magnetic field and electrical field which are 90 degrees out of phase. 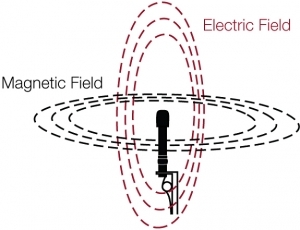 Of practical importance in communications, antenna polarization reflects the direction of the electric field relative to the Earth’s surface and the antenna’s physical construction/ orientation. Antenna polarization within a system should be the same for reliable communications. Illustrated above, polarization is the orientation of the antenna, the electric field and Earth’s surface. A mismatch in polarization introduces severe communication losses into a system. As antennas are designed and manufactured to a given frequency or to operate within a band of frequencies, matching antenna specifications to the frequency of the system is pivotal to reliable communications. While a mismatch of antenna to system frequency may still allow some absorption of the waveform, its relative efficiency and reliability are greatly reduced. Different types of antenna technology are discussed subsequently. The basis of antenna design and gain is the theoretical isotropic antenna which radiates in a three dimensional spherical pattern (see below). The isotropic antenna is a theoretical construct only as the radiation pattern becomes distorted in certain directions in physically realisable antennas. 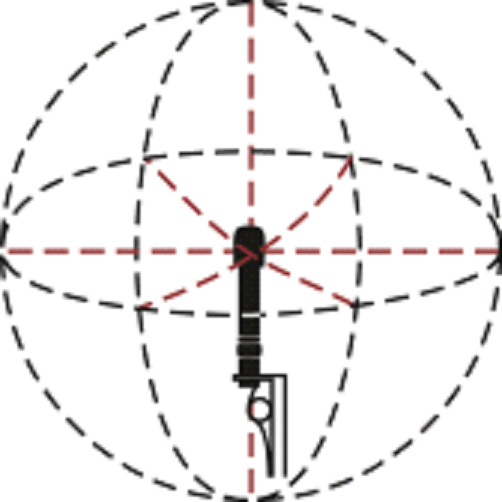 Image above depicts an isotropic antenna radiating a three dimensional spherical pattern. Dipole antennas are manufactured with an active conductor (referred to as a radiator) equal to ½ the wavelength of the design frequency. The effect of the 1/2 wavelength design is to distort the RF power envelope direction to the horizontal plane (ie there is more power radiated to the sides than up and down). The directed radial envelope is commonly referred to as the antenna’s gain which compensates for losses created in the coaxial cable and connectors. Antenna gain may be expressed as either dBi or dBd and can be confusing as manufacturers do not always specify which metric is referenced. When antenna gains are expressed as a comparison to the transmitter (TX) power/ isotropic antenna, they are referenced in dBi. Conversely, if the antenna gain is referencing a dipole antenna, it is referenced to dBd. The directed gain of a dipole antenna + 2.14 dB indicates there is an increased horizontal gain of 2.14dB (with consequent vertical loss), relative to power from the transmitter (TX power)/ isotropic antenna. Establishing the reference point as either dBi or dBd is of practical importance in system design given the increased reach of the dipole antenna relative to a reference isotropic antenna. 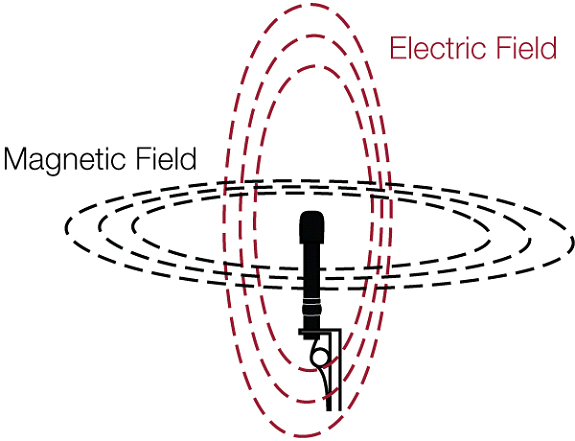 Irrespective of reference point, for effective communications reach, a dipole should be mounted vertically at it has a positive gain in the horizontal plane given the orientation of the electric field relative to the Earth’s surface. As illustrated, the dipole antenna distorts the directed energy in the horizontal plane with consequent loss in the vertical plane (ie up and down). As indicated, government regulations mandate the amount of radio power emitted from a wireless device in order to manage the spectrum. These bodies will reference the maximum transmitter power and overall gain relative to an isotropic antenna or gain relative to a dipole antenna. 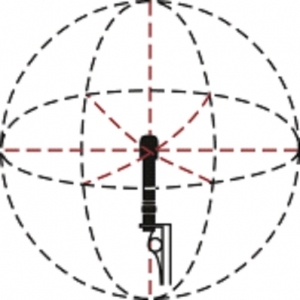 Equivalent/ effective isotropically radiated power (EIRP) is a measure of overall gain (including coaxial and connector losses) referencing an isotropic antenna of equivalent signal strength, measured in dBi. As the isotropic antenna is a theoretical construct, a more practical measure is the effective radiated power or ERP. ERP also references overall gain (including coaxial cable and connector losses) relative to a half-wave dipole antenna and is measured in dB. By design, the horizontal radiation pattern can be extended further by connecting multiple dipole elements together. These antennas are known as collinears and are normally manufactured with gains of 5dB, 8dB or 10dB. Like dipoles, collinear antennas are vertically polarized for effective communications. As illustrated, the collinear antenna further distorts the directed energy in the horizontal plane improving reliable communications distances. Dipole and collinear antennas are termed omnidirectional as they transmit in an approximate 360 degree horizontal radius. Typical uses for these types of antenna are where outlying units are scattered around a sizable arc radius and/or in inter-plant applications where reflected signals over short distances are received at various arcs to the original. The forward direction of the radiated waveform can be further increased by adding reflector elements which act to focus the waveform in a forward direction (with the consequence that the back and side lobes are reduced). These types of antenna are referred to as Yagi antennas with the addition of more reflector elements adding forward gain but a more focused narrower beam width. These antennas are often used for long line of sight radio point to point applications and intra-plant applications. Yagi antennas focus the waveform in a forward direction reducing lobes at the rear and sides of the antenna; typically used over longer distances in a point to point fashion. With increased forward gain Yagi antennas beam width becomes narrower. Yagi’s are mounted with the central beam horizontal and the orthogonal reflector elements either vertical or horizontal (relative to the Earth’s surface). If the elements are vertical, the Yagi is transmitting with vertical polarization; if the elements are horizontal, the polarity is horizontal. 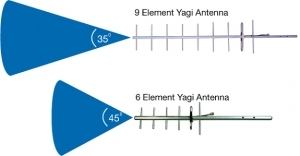 Polarization of a Yagi antenna will impact on the orientation of the propagated waveform. The previous antennas centered on distance communications but not all wireless communications involve longer communications links (eg replacement of slip-rings on a rotating kiln). Applications over shorter distances may necessitate the use of a ¼ wave whip antenna. These antennas are simply a ¼ wavelength conductor and can be mounted directly to the wireless device (typically ground-dependant antennas using the housing Earth to propagate). Another option is to have a small run of coaxial cable attached (ie ground-independent) for antenna placement flexibility. More generally ¼ wave whip antennas range from unity gain to a loss of -2dB when combined with the coaxial cable. Another antenna option used in higher frequencies such as 2.4GHz is the parabolic antenna. Parabolic antennas add side reflectors to amplify the forward gain even further (relative to a Yagi antenna) but with extremely narrow beam-widths. For 2.4GHz devices, parabolic reflectors behind the dipole element yield extremely high gains and extremely narrow transmission beams. From left to right, (A and B) 1/4 wave whip antennas with and without coaxial cable, (C) 2dB gain dipole, (D) 5 dB gain collinear, (E) 6 element Yagi and (F) 2.4GHz parabolic antenna. Note: images are not to scale. The basis of antenna design and gain is the theoretical isotropic antenna which radiates in a three dimensional spherical pattern (see below). The isotropic antenna is a theoretical construct only as the radiation pattern becomes distorted in certain directions in physically realisable antennas. By design, the horizontal radiation pattern can be extended further by connecting multiple dipole elements together. These antennas are known as collinears and are normally manufactured with gains of 5dB, 8dB or 10dB. Like dipoles, collinear antennas are vertically polarized for effective communications. The forward direction of the radiated waveform can be further increased by adding reflector elements which act to focus the waveform in a forward direction (with the consequence that the back and side lobes are reduced). These types of antenna are referred to as Yagi antennas with the addition of more reflector elements adding forward gain but a more focused narrower beam width. These antennas are often used for long line of sight radio point to point applications and intra-plant applications. Please contact EDAC on 03 97626244 for help with antenna selection. REMOTE MONITORING AND THE NBN. KNOW WHERE YOU STAND. The National Broadband Network (nbn™ network) is upgrading most existing phone networks in Australia. 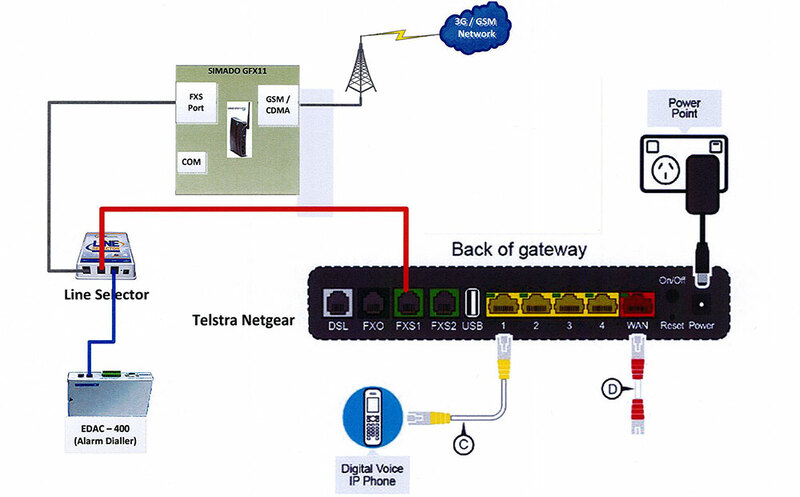 Your Voice Dialler can continue to operate on the NBN by requesting that your NBN provider supplies either an FXS or a UNI-V port on their connection box to plug in your voice dialler (analog phone device). One drawback of the new network connections is that they’re not guaranteed to work during a power outage as the nbn™ access network requires power at both the exchange and within the home or business to operate. a substitute pathway such as a Cellular device can be installed prior to migrating the nbn™ network to ensure safe and reliable voice connection during a power outage. A line selector switch can be implemented to switch between networks as necessary or the dialler can be plugged straight to the cellular interface to be used on the alternate network. We recommend voice alarm notification over SMS in case of critical alarms. Voice calls are more likely to be answered, particularly at odd hours, cannot be delayed and your voice dialler will continue to dial the pre-programmed phone number in succession until the alarm is acknowledged. For an efficient pre-assembled voice dialler monitoring system ask Edac to supply the electrical box complete with your pre-configured dialler, battery back-up power supply and optional cellular interface with an antenna to suit the reception requirement at the designated installation site. EDAC Electronics Australasia supplies remote monitoring, control and alarming equipment to industry and end users around Australia and overseas. Our environmental monitoring equipment and industrial alarm systems have been used for over 26 years to monitor utilities, refineries, freezers and agricultural applications.